You may notice something different – instead of naming the recipe “noodles” or “pasta,” I’m specifying – fettucine. If you use Blade B, you’ll notice that the noodles come out a bit flatter than if you use the spaghetti blade (C). Flatter and a bit wider. Like fettucine! So, today, I’m making butternut squash fettucine. With goat cheese and thick-cut bacon. And kale, cooked in said bacon fat. I don’t use Blade B nearly enough. It’s ideal for making half-shaped macaroni-type noodles and for use on apples. Sometimes, I use it on sweet potatoes if I have trouble spiralizing them, it’s a quick fix. Sometimes, that darn sweet potato doesn’t want to shove itself through those little triangular blades. I get it. Sometimes, I, like the sweet potato, don’t want to do what I’m told. The key to this dish is truly the thick-but bacon. When you cook it in the skillet, it curls up wonderfully in its thick glory and is perfectly salty and crunchy. Once you start see it browning, it’s pretty much done – about 5-7 minutes. 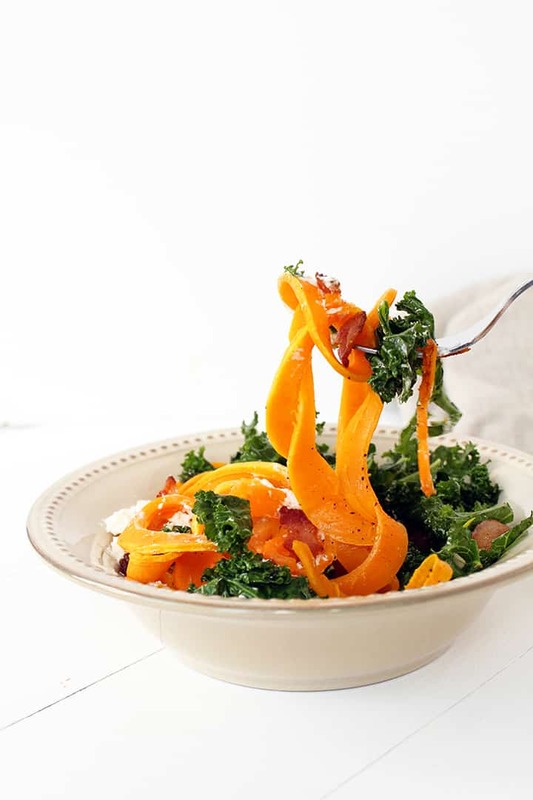 Cooking the kale and garlic in the bacon grease is a trick to avoid using extra added oil but also, it infuses the kale with bacon flavor. 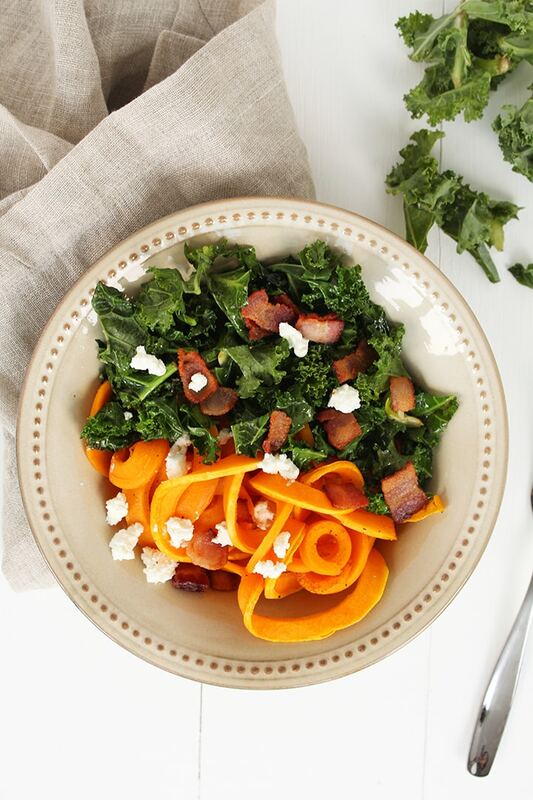 You can swap in pancetta here for a sweeter twist. The goat cheese pulls everything together in its creamy smoothness, ensuring every bite has textures and flavors that marry well together. If you’re Paleo or just dairy-free, skip the goat cheese and add in small cubes of warmed avocado for that same velvety-ness. 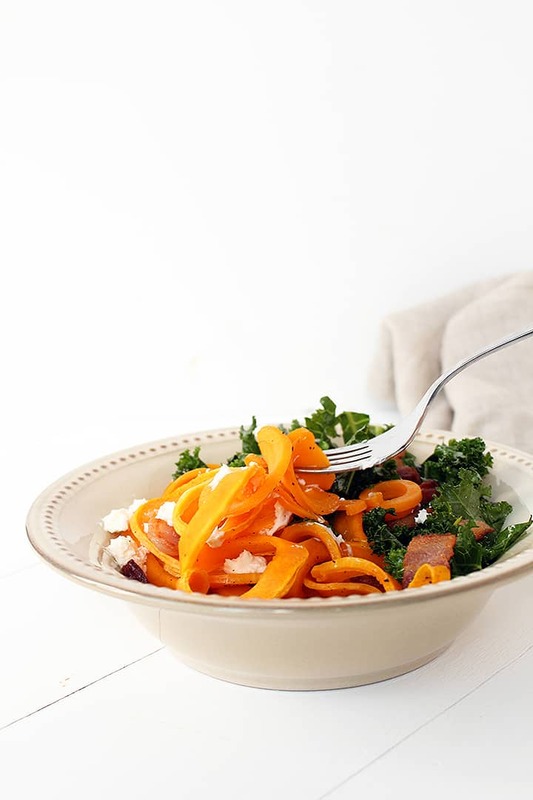 While this pasta doesn’t have a specific sauce, the oils in the bacon, the olive oil from roasting the squash and the creaminess of the goat cheese create their own unbelievable combination, taking the place of a sauce. Okay, now I’m hungry again. 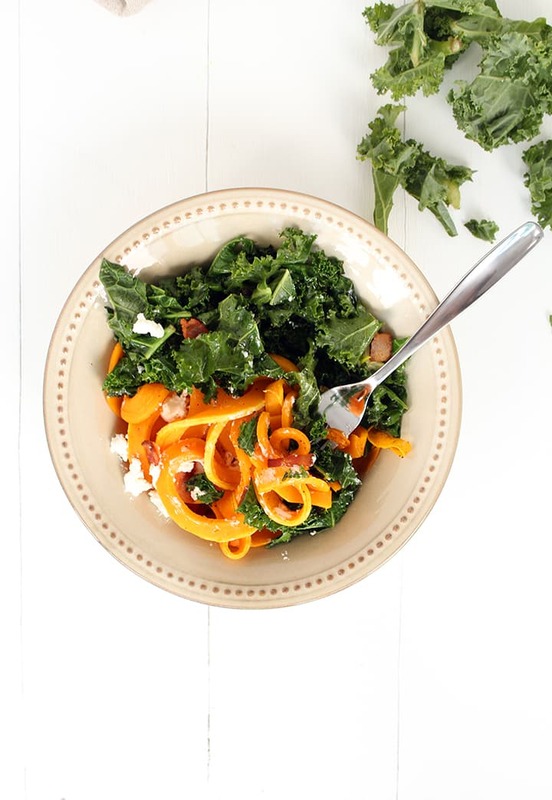 What’s your favorite noodle shape for butternut squash? Preheat the oven to 400 degrees. Line a baking sheet with parchment paper and lay out the squash noodles. Drizzle with the olive oil, season with pepper and roast for 8-10 minutes or until al dente. Place a large skillet over medium heat and once heated, add in bacon. Let bacon cook until crispy about 5-7 minutes per side. Once cooked, transfer to a plate with slotted spoon and leave a little more than half of the bacon grease in the pan. Immediately add in the garlic and kale and season with salt and pepper. Cook, tossing occasionally, for 5 minutes or until wilted and cooked. 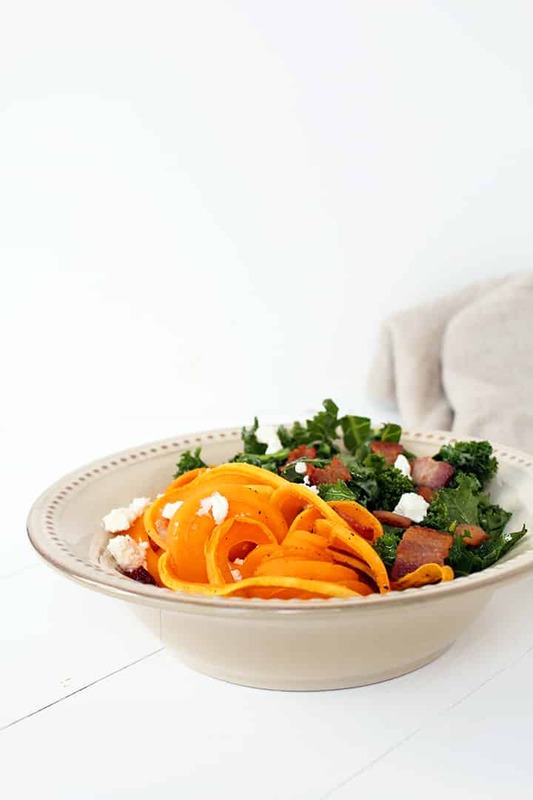 Divide butternut squash noodles into bowls and top with equal amounts of kale, bacon and goat cheese. This looks delicious, but I'm confused. Isn't the B blade the one with the larger triangle cuts? Do you mean the A blade, or does the newer model have a different B blade (I still have the original model)? I pretty much always choose fettuccine over spaghetti anyway, so I love my B blade! This sounds like a fabulous butternut noodle dish. This sounds wonderful. Really looking forward to trying it. Made this for dinner tonight - it was fabulous!! Looks like something fun and new to try! I've never made butternut squash noodles before. Will have to give it a shot! Made this for lunch today -- really quick and fabulous! Because of this particular recipe, I ordered the Paderno machine you recommend. The blades don't have letters, though. What blade are you talking about? Check out my How To page! I've tried kale twice before and hated it. I had bought it for the third time and just got my new spiralizer, so I made this recipe for dinner last night. I massaged the kale before chopping it and the whole dish was fabulous. Can't wait to eat the leftovers tonight. Go to my How To Spiralize page, I have information on all of that!! I have checked out Inspiralized.com/howto - I can not find any info to answer the questions posed by Carolyn M, Melissa and Morgan. In addition, there is no "how to" page - just a "get started" page - correct? I like your content but am having problems navigating your website - thanks! This dish is unbelievably delicious-loving every bite of it!